Having seen the elephant photo all over the place for some time, Saki and I hurried over to Pier 54 to have a look at Ashes and Snow for ourselves before it closed and were amazed. 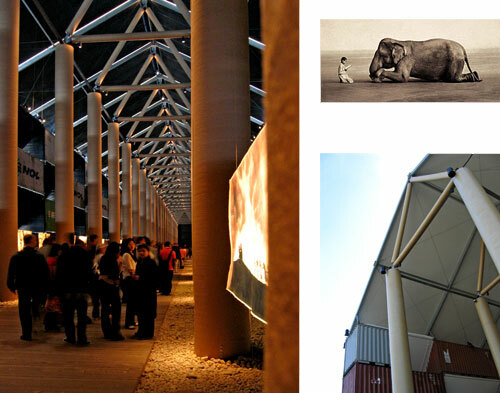 What most impressed was Shigeru Ban’s structure. I was expecting a pile of shipping containers with some photos on the wall. Instead I found one of the most exciting and awe inspiring spaces that New York has ever had to offer, and like the Central Park Gates project, it wasn’t around for long (it is now all being shipped to California). First of all, this thing is huge! On entering you found yourself in a fabulous, dark, ethereal, and seemingly endless cathedral space stretching a full City block out into the Hudson. While constructed of shipping containers, sonotubes, canvas, and steel cable, with a floor of wooden planks and river stones, it has all the authority and majesty of any cathedral nave you have ever visited. Truly wonderful and a must-visit if you encounter it on your travels. The photos I was less enthusiastic about. While there is no denying that many of these images are stunning, the more I saw the more I felt uneasy about the apparently contrived posing and what to me seemed an intrusively “arty” presentation. If these had been paintings (which they nearly are) I think they would seem the epitome of Shmaltz and the fact that they are photos does not ultimately redeem them in this respect. One would love to think that the child had innocently happened upon the elephant and stopped to consider it, and that the photographer had innocently (or purposely) happened upon both. But that not being the case what we end up with seems somewhat unsubstantial. But that’s just my opinion. Do not miss out on the chance to see for yourself. Totally agree with you thoughts about Ashes and Snow exhibit. The structure is fantastic, though. When and where will Ashes and Snow be in California?